Vista and Windows 7 users right click the icon and choose "Run as administrator". When it finishes, press the save log button, save the logfile to your desktop and post its contents in your next reply. [indent]It is possible that the infection you are trying to remove will not allow you to download files on the infected computer. If this is the case, then you will need to download the files requested in this guide on another computer and then transfer them to the infected computer. You can transfer the files via a CD/DVD, external drive, or USB flash drive. You are currently running Windows XP Home Service Pack 2. The latest service pack is service pack 3. Download service pack 3 HERE and install it. Next, please download exeHelper to your desktop. Get it HERE. [b]Next, please download exeHelper to your desktop. Get it [/b][url="http://www.raktor.net/exeHelper/exeHelper.com"][color="#0000FF"][b]HERE[/b][/color][/url]. [*][b]Double-click[/b] on [color="#0000FF"]exeHelper.com[/color] to run the fix. [*]A black window should pop up, [b]press any key [/b]to close once the fix is completed. you must verify that you can access the Windows7 Recovery Environment.To do so, restart your computer and begin tapping the F8 key to enable the Advanced Start menu. If the option 'Repair your computer' is available, select it. If not available, you will need to insert your Windows7 installation dvd and restart, then press any key when prompted to boot from the cd. Please download maxlook, saving the file to your desktop. Double click maxlook.exe to run it. Note - you must run it only once! As instructed when the tool runs, restart the computer and logon to the Recovery Environment. Once you get to the System Recovery Options screen, first take note of the drive letter assigned to the operating system, then select Command Prompt. Type the following bolded command at the x:\sources> prompt (or x:\windows\system32>) then hit Enter. You will see many files copied then return to the x:\windows> prompt. Type Exit then restart your computer and logon in normal mode. Once back in Windows, click Start > Run, and copy/paste the following then press Enter. Note - you must run it only once! Follow the prompts, and attach the C:\looklog.txt in your next reply. [b]First, [/b][indent]you must [b]verify[/b] that you can access the [color="#0000FF"][b]Windows7 Recovery Environment[/b][/color].To do so, [b]restart [/b]your computer and begin [b]tapping the F8 key [/b]to enable the [b]Advanced Start menu[/b]. If not available, you will need to [b]insert your Windows7 installation dvd and restart[/b], then [b]press [/b]any key when prompted to boot from the cd. [indent]Please [b]download [/b][url="http://noahdfear.net/downloads/maxlook.exe"][color="#0000FF"][b]maxlook[/b][/color][/url], saving the file to your desktop. [indent][b]Type [/b]the following bolded command at the x:\sources> prompt (or x:\windows\system32>) then[b] hit Enter[/b]. You will see many files copied then return to the [color="#FF0000"][b]x[/b][/color]:\windows> prompt. [indent]Once back in Windows, [b]click Start > Run[/b], and [b]copy/paste[/b] the following then [b]press Enter[/b]. Before we are done, we want to follow up with three tools to make sure the job is complete. The first tool will clean out the temporary files on your system. The second will scan for and remove malware that it finds may still be on your machine. The third is an online virus scan that you can run from your browser. Please download OldTimer's Temp File Cleaner. Get it here. This program will close all applications before it begins. So, please save all work before running it. While it is running, the desktop will disappear. This is normal. After it cleans, you may have to allow it to restart your computer. To run it, double click on the TFC.exe file you downloaded. Save all your work in any open windows. Click the "Start" button in the lower left corner of the TFC application window. Push , and save the file to your desktop using a unique name, such as MyEsetScan. Include the contents of this report in your next reply. In your next reply please post the logs created by Malwarebytes and the ESET Online Scan. How is your system is running now? [*]The first tool will [b]clean out the temporary files [/b]on your system. [*]The second will [b]scan for and remove malware[/b] that it finds may still be on your machine. [*]The third is an [b]online virus scan[/b] that you can run from your browser. Please download [b]OldTimer's Temp File Cleaner[/b]. Get it [url="http://www.geekstogo.com/forum/files/file/187-tfc-temp-file-cleaner-by-oldtimer/"][color="#0000FF"]here[/color][/url]. [*]This program [b]will close all applications[/b] before it begins. [*]So, please [color="#FF0000"][i]save all work[/i][/color] before running it. [*]While it is running, [b]the desktop will disappear[/b]. This is normal. [*]After it cleans, you may have to [b]allow it to restart your computer[/b]. [*][b]To run it[/b], double click on the [b]TFC.exe [/b]file you downloaded. [*][b]Save all your work [/b]in any open windows. [*]Click the [b]"Start"[/b] button in the lower left corner of the TFC application window. [*]Make sure a checkmark is placed next to [b]Update Malwarebytes' Anti-Malware[/b] and [b]Launch Malwarebytes' Anti-Malware[/b], then click Finish. 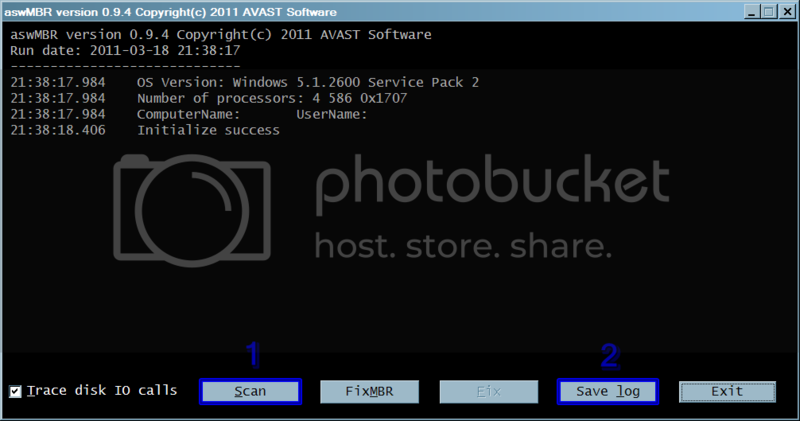 [*]Once the program has loaded, select "[b]Perform Quick Scan[/b]", then click [b]Scan[/b]. [*]The scan may take some time to finish,so please be patient. [*]Make sure that [b]everything is checked[/b], and click [b]Remove Selected[/b]. [*]The log is automatically saved by MBAM and can be viewed by clicking the Logs tab in MBAM. [*]Copy&Paste the entire report in your next reply. [indent][color="#9932CC"][b]Note: It is recommended to disable on-board anti-virus program and anti-spyware programs while performing scans so there are no conflicts and it will speed up scan time. [*]Click on [img]http://billy-oneal.com/Canned%20Speeches/speechimages/eset/esetSmartInstall.png[/img] to download the ESET Smart Installer. Save it to your desktop. [*]Double click on the [img]http://billy-oneal.com/Canned%20Speeches/speechimages/eset/esetSmartInstallDesktopIcon.png[/img] icon on your desktop. [*][b]Accept [/b]any security warnings from your browser. [*][color="#0000FF"]ESET[/color] will then [b]download[/b] updates for itself, [b]install [/b]itself, and [b]begin scanning[/b] your computer. Please [b]be patient[/b] as this can take some time. [*][b]Push [/b] [img]http://billy-oneal.com/Canned%20Speeches/speechimages/eset/esetExport.png[/img], and [b]save [/b]the file to your desktop using a unique name, such as [color="#0000FF"]MyEsetScan[/color]. [b]Include [/b]the contents of this report in your next reply. In your next reply please [b]post [/b]the logs created by [color="#0000FF"]Malwarebytes[/color] and the [color="#0000FF"]ESET Online Scan[/color]. Double-click on the Unhide.exe icon on your desktop and allow the program to run. This program will remove the hidden attributes from all the files on your system. Note: If you had purposely hidden any files, then you will need to hide them again after this tool has run. [*]Double-click on the Unhide.exe icon on your desktop and allow the program to run. [*]This program will remove the hidden attributes from all the files on your system. [*]Note: If you had purposely hidden any files, then you will need to hide them again after this tool has run.